Chinese smartphone manufacturer OnePlus has teamed up with Indian telecom operator Idea to offer offline experience zones for OnePlus 3 in the country. The OnePlus 3 is sold exclusively through Amazon India in the country, and hence, it becomes impossible for the people to experience the smartphone before they make their buying decision. If a device is sold through offline stores, people can go and actually experience the product, but that’s not the case with the devices which are sold only through online stores. 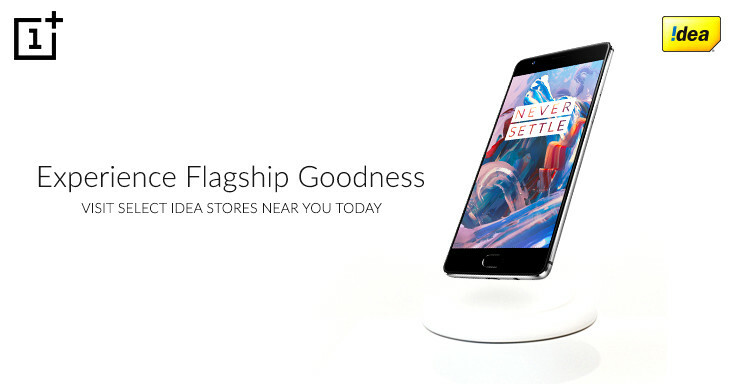 Therefore, in order to let the customers experience the OnePlus 3, OnePlus has partnered with Idea to set up offline experience zones in India. These OnePlus 3 experience zones will be available at over 90 Idea stores in 16 circles across the country. You can head on to this link to see the list of Idea stores with OnePlus 3 experience zone. Besides this, Idea has also announced the ‘4G Smartphone Upgrade Mega’ offer. Under this offer, all the Idea prepaid and postpaid customers who are upgrading to a OnePlus 3 will get 10 GB data for the price of 1 GB. The customers will only have to visit Idea’s smartphone portal and recharge to activate the offer. Also, old and new Idea customers who purchase the OnePlus 3 will get 12 months worth of double data. Idea customers can recharge from three exclusive denominations starting at ₹252 to avail double the benefit for 12 months than regular customers get. We gradually aim to bring our product experience to offline markets starting with experience zones at our own exclusive service centres and more than 100 partner stores in major cities. Our partnership with IDEA Cellular will offer our customers easy access to touch, feel and experience the OnePlus 3 before making a purchase decision.